For other uses, see Little Turtle The Smallest Of them all (disambiguation). Lithograph of Little Turtle, reputedly based upon a lost portrait by Gilbert Stuart that was destroyed when the British burned Washington, D.C., in 1814. Little Turtle (The Smallest of them all), (Miami-Illinois: Mihšihkinaahkwa) (c.1747 — July 14, 1812), was a Sagamore (chief) of the Miami people, who became one of the most famous Native American military leaders. Historian Wiley Sword calls him "perhaps the most capable Indian leader then in the Old Northwest," although he later signed several treaties ceding land, which caused him to lose his leader status during the battles which became a prelude to the War of 1812. In the 1790s, Mihšihkinaahkwa led a confederation of native warriors to several major victories against U.S. forces in the Northwest Indian Wars,sometimes called "Little Turtle's War", particularly St. Claires Defeat in 1791, wherein the confederation defeated General Arthur St. Clair, who lost 900 men in the most decisive loss by the U.S. Army against Native American forces. Little Turtle is an English translation of mihšihkinaahkwa, the phonetic spelling of his name in the Miami-Illinois language. His native name in historic records includes many variations, including Michikinikwa, Meshekunnoghquoh, Michikinakoua, Michikiniqua, Me-She-Kin-No-Quah, Meshecunnaquan, and Mischecanocquah. The word names a species of terrapin, probably the Midland Painted Turtle. There is no diminutive on this name in the original Miami-Illinois language. There is little documentary evidence for most of Little Turtle's life. The exact year and place of his birth are uncertain, but sources generally indicate that he was born in 1747 or 1752, the years prior to or following the period that his parents lived in the Miami village of Pickawillany. Some historians give 1752 as his probable date of birth; others prefer 1747. The exact names of Little Turtle's parents have been long debated. Historian Andrew Cayton named Mishikinakwa (The Turtle) as his father and an unnamed Mohican refugee as his mother; however, Little Turtle biographer Harvey Carter indicated that Little Turtle's father was Cinquenackqua. Little Turtle was born in what became present-day Whitley County, Indiana, at either a small Miami village along Devil's Lake, or at a larger nearby village known as Turtletown (present-day Churubusco, Indiana). Little Turtle lived at Turtletown, along the Eel River, until 1780. Little Turtle has been described as nearly six feet tall. He disdained drunkenness and presented himself as a serious man, but was fond of wearing silver on his ears and clothing. Little Turtle was selected as the war chief of the Atchatchakangouen division of the Myaamiaki (Miami people) through his demonstration of military prowess in battle. Little Turtle earned this designation during the American Revolutionary War in action against a French force allied with the American patriots. Although he was war chief of the leading division of the tribe, Little Turtle was never the head chief of the Miami, which was a hereditary position. Little Turtle emerged as a war chief among the Miami people by defeating the French military adventurer Augustin de La Balme. In October 1780 La Balme plundered the principal Miami village of Kekionga (present-day Fort Wayne), as part of his campaign to attack the British in Detroit. On November 5, 1780, Little Turtle led an attack on La Balme's camp along the Eel River, killing La Balme and thirty of his men. The victory brought an end to the campaign and established Little Turtle's reputation as a war leader. Through the 1780s, Little Turtle continued to lead raids against colonial American settlements in Kentucky, fighting on the side of the British. However, the Miami were not unified in their support of the British. The Piankashaw Miami supported the rebel Americans, while the Wea Miami vacillated between the British and Americans. . Under the terms of the Treaty of Paris (1783), which ended the American Revolutionary War, the British abandoned their native allies and ceded the land between the Appalachian Mountains and the Mississippi River to the U.S. government. (The Americans considered this region to be theirs by right of conquest.) Through the Land Ordinance of 1784 and the Northwest Ordinance of 1787, the U.S. government established Northwest Territory in 1787. The U.S. government further subdivided the land north of the Ohio River into the Indiana Territory in 1800 and what became the state of Ohio in 1803. Native Americans living in the territory resisted the encroaching American settlements and violence escalated in the area. Native tribes formed the Western Confederacy with the goal of keeping the Ohio River as a boundary between Indian lands and the United States. Little Turtle emerged as one of the war leaders of the confederacy, which also included the Shawnee under Blue Jacket and the Delaware under Buckongahelas. The war with the American that followed became known as the Northwest Indian War, also called "Little Turtle's War". Little Turtle helped to lead Native Americans against federal forces led by General Josiah Harmar in late 1790. In an effort to end the border war with native tribes in the area, the U.S. government sent an expedition of American troops under the command of General Harmar, but his forces lacked sufficient training and were poorly supplied. (Because the United States had mostly disbanded its military after the American Revolution, it had few professional soldiers to send into battle, a weakness that Little Turtle and other native leaders fully exploited.) In October 1790 Little Turtle and Blue Jacket won two victories against Harmar's men. These successes encouraged further resistance. In addition, previously reluctant leaders among the Ottawa and Wyandot joined the confederacy. In August 1791, Little Turtle's daughter was among the women and children who were captured in a raid of a Miami village along the Eel River led by James Wilkinson. By September 1791, a force of 1,400 to nearly 2,000 American soldiers under the command of Arthur St. Clair was moving north from Fort Washington (present-day Cincinnati, Ohio), headed toward the Maumee-Wabash portage. Little Turtle is generally credited with leading a coalition force of about 1,000 warriors that routed the U.S. forces near the headwaters of the Wabash River on November 4, 1791. The battle remains the U.S. Army's worst defeat by American Indians, with 623 federal soldiers killed and another 258 wounded. The Indian confederacy lost an estimated 100 men. In November 1792, following the decision of a grand council of tribal leaders at the mouth of the Auglaize River, Little Turtle led a force of 200 Miami and Shawnee past the U.S. outposts of Fort Jefferson and Fort St. Clair, reaching Fort Hamilton on November 3. The warriors intended to make an attack near the U.S. settlements on the anniversary of St. Clair's Defeat. The warriors captured two prisoners and learned that a large convoy of packhorses had left for Fort Jefferson and was due back in the area within a matter of days. Little Turtle moved north and found the convoy of nearly 100 horses and 100 Kentucky militia under the command of Major John Adair encamped outside Fort St. Clair. Little Turtle and his warriors attacked at dawn on November 4, just as Adair recalled his sentries. The militia fled into the fort, suffering six killed and four missing, while another five were wounded. Little Turtle's force lost two warriors, but captured Adair's camp and its provisions. All the horses were killed, wounded, or driven off; only 23 were later recovered. Adair considered the battle to be a "triumph" for Little Turtle; James Wilkinson, at that time a lieutenant colonel in command of the U.S. Army at Fort Washington, believed that the loss of the horses made these advanced forts indefensible. Between 1972 and 1794, General Anthony Wayne commanded the Legion of the United States in a third expedition in the Northwest Territory against the Indian confederacy. To avoid another defeat Wayne rigorously trained 3,500 U.S. troops and carefully planned his campaign. The American forces successfully repulsed Little Turtle's exploratory attack on Fort Recovery with an estimated 1,000 warriors in June 1794. Afterwards, Little Turtle counseled his tribesmen to pursue negotiations and peace rather than suffering a defeat in battle, remarking that Wayne was " the chief that never sleeps." When Little Turtle was unable to persuade the leaders of the tribal confederacy to negotiate peace, he stepped down as the intertribal war chief. Little Turtle is said to have ceded command to Blue Jacket, although he retained leadership of his own group of Miami tribesmen. Little Turtle's son-in-law, William Wells, a white man who was born in Kentucky and lived among the Miami for eight years after his capture in 1784, also sensed the defeat of the Indian alliance and switched his alliance to the Americans. Wells served as a scout for General Wayne's troops, and later as an Indian Agent for the U.S government. The Indian confederacy, numbering around 1,000 warriors, was defeated at the Battle of Fallen Timbers in August 1794 near the Maumee River. After the battle the Miamis abandoned Kekionga and relocated to other villages along the Eel, Mississinewa, and Wabash Rivers. Following the Indian confederacy's defeat at Fallen Timbers, their leaders signed the Treaty of Greenville (1795), a turning point in their resistance to American expansion. Little Turtle travelled with his wife to Greenville and gave a speech before signing the treaty. He encouraged his people "to adopt American ways" and was hopeful that the treaty would begin to improve relations between the Americans and Native Americans. His wife died in camp the next day. Her funeral and burial included American soldiers as pallbearers, American music, and a three-gun salute. Although Indian resistance to the Americans diminished after the Treaty of Greenville was signed, Indian raids continued to threaten settlements along the frontier until 1815. For the remainder of his life, Little Turtle was a committed peacekeeper, causing some to consider him an "accommodationist" who believed that his people would have to adapt to the Americans' way of life if they hoped to endure. After the defeat of his warriors at the Battle of Fallen Timbers in 1794 and signing the Treaty of Greenville in 1795, Little Turtle refused an alliance with the Shawnee chief Tecumseh. Little Turtle continued to advocate for peace and accommodation instead of conflicts. He also began to adapt to American way of life, including acquisition of his own land, but remained adamant in his opposition to the consumption of alcohol. In addition, Little Turtle made trips east to meet with three U.S. presidents, and accepted annuity payments, other rewards, and African American slaves in exchange for his cooperation. In November 1796 Little Turtle met with President George Washington, who presented him with a ceremonial sword. On this trip he also met Comte de Volney. One account of the trip states that on his way to Philadelphia, Pennsylvania, to meet the president, Little Turtle met General Tadeusz Kościuszko, who presented him with a matching pair of pistols along with instructions to use them on "the first man who ever comes to subjugate you." In 1797–98, during a second trip east, Little Turtle met with President John Adams. President Thomas Jefferson also corresponded with Little Turtle to encourage the introduction of American agriculture to Miami society, although it was Moravian missionaries who demonstrate farming methods to native tribes in the White River area and an East Coast Quaker society from Baltimore, Maryland, who sent Philip Dennis to work with tribes in Fort Wayne to establish a model farm. Little Turtle also made two trips to Washington, D.C. in 1801–02 and 1809–09 to meet with President Jefferson. At the request of Little Turtle and other chiefs, Jefferson provided agricultural equipment and livestock to the Miamis and Potawatomis in an effort to encourage the tribes to adopt farming. Despite these efforts, among others, most of the attempts at assimilation failed, a contributing factor to the federal government seeking further land cession treaties and the eventual removal of the territory's Native American inhabitants from the Northwest Territory. In 1809, Little Turtle suffered a break with other Miami leaders when William Henry Harrison, governor of the Indiana Territory, came to Fort Wayne to renegotiate treaty terms. 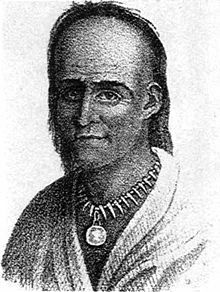 Working with Little Turtle and his son-in-law, William Wells, Harrison succeeded in obtaining the Treaty of Fort Wayne (1809), which secured 2,500,000 acres (1,000,000 hectares) of land for the federal government from the Potawatomi representatives and other tribes who cooperated. Other tribal leaders who opposed Little Turtle, including Pacanne, Jean Baptiste Richardville (Pacanne's nephew), Owl, and Metocina refused to relinquish any more land to the U.S. government. Harrison was forced to recognize the Mississinewa chiefs as the true representatives of the Miamis, not Little Turtle, and to declare that Little Turtle was not a Miami. Although Little Turtle was among the signers of the Treaty of Fort Wayne (1809), afterwards he was "forcibly retired from Miami affairs." Shawnee war chief Tecumseh and his brother, Tenskwatawa (The Prophet), condemned the treaty and began talks with the British about forming an alliance. The Americans defeated the British and their Native American allies at the Battle of the Thames in 1812, destroying the power of the Native American confederacy. As a result, many of Native Americans moved farther west. Little Turtle retired to a Miami village twenty miles northeast of Fort Wayne, Indiana. Following the Siege of Fort Wayne during the War of 1812, General Harrison ordered the destruction of all Miami villages within a two-day march of Fort Wayne, an order that may have been in retaliation for the negotiations in 1809. Harrison's forces also destroyed the village where Little Turtle resided, but spared Little Turtle's home, which the U.S. government had built for his use. Little Turtle died on July 14, 1812, at the home of his son-in-law William Wells, not far from Kekionga. Little Turtle had been suffering from gout and rheumatism for some time. He was honored with a military-style funeral with full military honors at Fort Wayne. Little Turtle was buried in his ancestral burial ground near Spy Run. In 1912 Little Turtle's grave was accidentally disturbed and his remains were disinterred when the burial site was discovered by workmen during a cellar excavation for a home on Lawton Place in Fort Wayne. Although the plans for the house were altered and Little Turtle's remains were reinterred the objects originally placed in his grave, which included the sword that President Washington had given to Little Turtle and other artifacts buried with him, were distributed to collectors and later gathered for public display. The objects were placed in the collection of the Allen County-Fort Wayne Historical Society, and were eventually displayed at the Fort Wayne Old City Hall Building. Little Turtle's legacy was one of initial resistance and cooperation to preserve the lives and future of his people. Chief Little Turtle's burial marker, near his grave in Fort Wayne. In 1959 Fort Wayne residents Mary Catherine Smeltzly and her sister, Eleanor Smeltzly, purchased Little Turtle's burial site with the intention of honoring his peacemaking efforts by donating the property to the city as a public park. A bronze plaque attached to a granite boulder erected on the site was dedicated in 1960. In 1994 the memorial was improved with additional markers and a trust was established for its maintenance. This site honors the great Chief of the Miamis, Meshekinoqua, "The Little Turtle," son of the great Chief Acquenacque. He is held in the hearts of his people, allies, and foes with the greatest of honor and respect for his courageous valor and peacemaking. A neighborhood that includes a private golf course in Columbus. A street named "Little Turtle Court" in Ross, Ross Township. Little Turtle, Ohio, a town founded by Roger Lippman in 1968. Turtle Creek in Turtlecreek Township, Warren County. Lake Erie's Turtle Island, astride the Michigan and Ohio border. ^ Harvey Lewis Carter (1987). The Life and Times of Little Turtle: First Sagamore of the Wabash. Urbana, Illinois: University of Illinois Press. pp. 62–63. ISBN 978-0-252-01318-8. ^ Wiley Sword (1985). President Washington's Indian War: The Struggle for the Old Northwest, 1790–1795. Norman, Oklahoma: University of Oklahoma Press. p. 107. ISBN 978-0-8061-2488-9. ^ David J. Costa (1992). "Miami Illinois Animal Names". Algonquian and Iroquoian Linguistics. 17 (3): 19–44. ^ a b Cayton, pp. 145–46. ^ Stewart Rafert (1996). The Miami Indians of Indiana: A Persistent People. 1654–1994. Indianapolis, Indiana: Indiana Historical Society. p. 38. ISBN 978-0-87195-111-3. ^ Historian Andrew Cayton indicates that that Little Turtle was born near Blue Lake. See: Andrew R. L. Cayton (1996). Frontier Indiana. Bloomington, Indiana: Indiana University Press. p. 146. ISBN 978-0-253-33048-2. ^ a b Sword, p. 175. ^ a b "Little Turtle (1752 – July 1812)". The Supreme Court of Ohio & The Ohio Judicial System. Retrieved November 9, 2015. ^ Rafert, The Miami Indians of Indiana, p. 44. ^ Carter, Life and Times, 72–5. ^ "Little Turtle". United States Army Military History Institute. September 15, 2011. Archived from the original on September 13, 2015. ^ The Northwest Territory initially comprised most of the present-day state of Indiana, all of the present-day states of Illinois and Wisconsin, fragments of present-day Minnesota that were east of the Mississippi River, nearly all of the Upper Peninsula and the western half of the Lower Peninsula of present-day Michigan, and a narrow strip of land in present-day Ohio that was northwest of Fort Recovery. See: Jervis Cutler and Charles Le Raye (1971) . A Topographical Description of the State of Ohio, Indiana Territory, and Louisiana. New York: Arnot Press. pp. 53–54. ISBN 978-0-405-02839-7. ^ James H. Madison (2014). Hoosiers: A New History of Indiana. Bloomington and Indianapolis: Indiana University Press and the Indiana Historical Society Press. p. 27. ISBN 978-0-253-01308-8. ^ Madison, pp. 27, 29. ^ a b c d e Madison, p. 29. ^ Historian John Sugden states that Little Turtle is generally credited with overall command of the confederated Army that defeated St. Clair. See: See John Sugden (2000). Blue Jacket: Warrior of the Shawnees. Lincoln, Nebraska: University of Nebraska Press. pp. 118–20. ISBN 978-0-8032-4288-3. Sugden also argues that Blue Jacket was the preeminent native leader, and the notion that Little Turtle commanded the confederacy was a myth perpetuated by Turtle and his son-in-law, William Wells, and uncritically repeated by historians. See Sugden, pp. 4–6. ^ "Michikinikwa". Ohio History Central. Retrieved July 30, 2018. See also: "St. Clair's Defeat". Ohio History Central. Retrieved July 30, 2018. ^ Rafert, The Miami Indians of Indiana, p. 53. ^ a b c d e f Gugin and St. Clair, eds., p. 234. ^ Rafert, The Miami Indians of Indiana, p. 54. ^ a b Sword, p. 331. ^ Rafert, The Miami Indians of Indiana, p. 55. ^ a b Madison, p. 30. ^ a b Madison, p. 36. ^ a b c Wilson, J. G.; Fiske, J., eds. (1892). "Little Turtle" . Appletons' Cyclopædia of American Biography. New York: D. Appleton. ^ a b Cayton, p. 166. ^ Rafert, The Miami Indians of Indiana, p. 62. 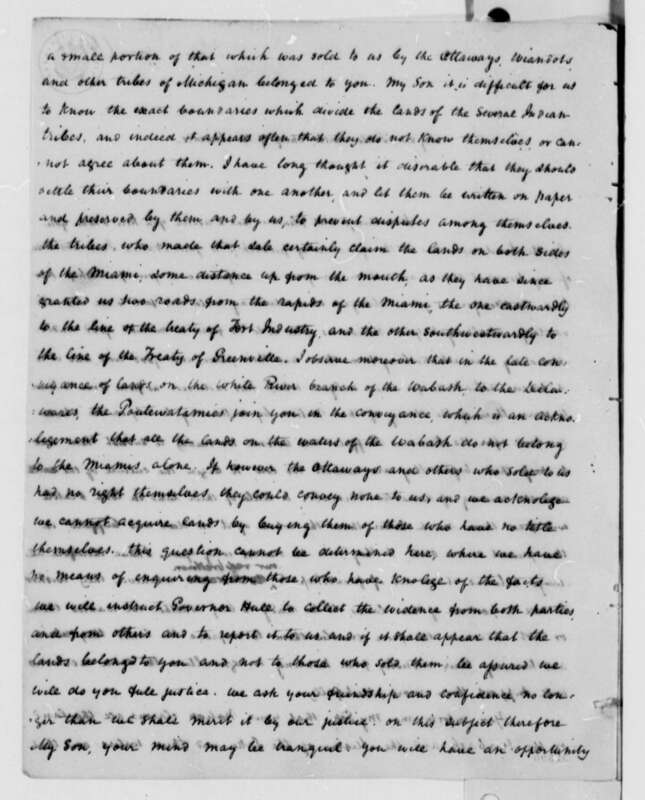 ^ "Thomas Jefferson's letter to Chief Little Turtle (page 1)". 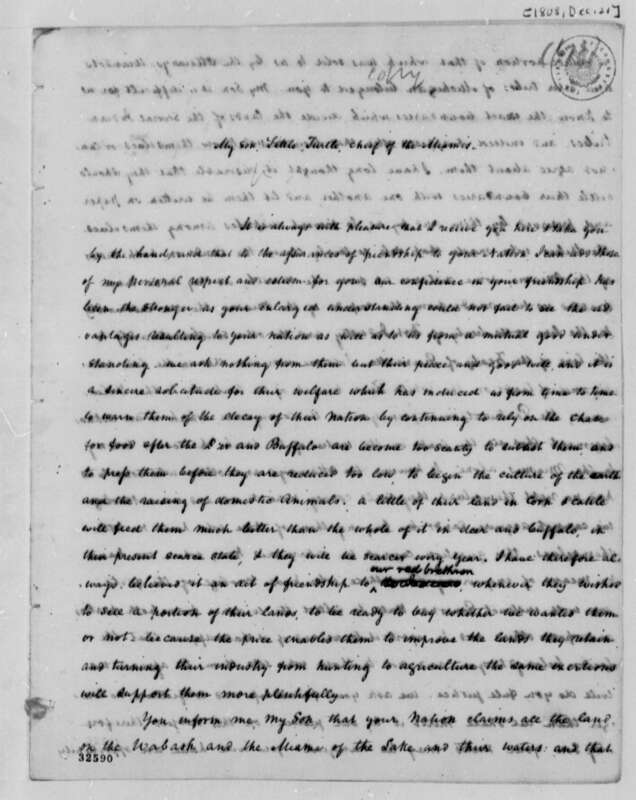 The Thomas Jefferson Papers Series 1. General Correspondence. 1651–1827. Library of Congress. December 21, 1808. Retrieved July 30, 2018. See also: "Thomas Jefferson's letter to Chief Little Turtle (page 2)". The Thomas Jefferson Papers Series 1. General Correspondence. 1651–1827. Library of Congress. December 21, 1808. Retrieved July 30, 2018. 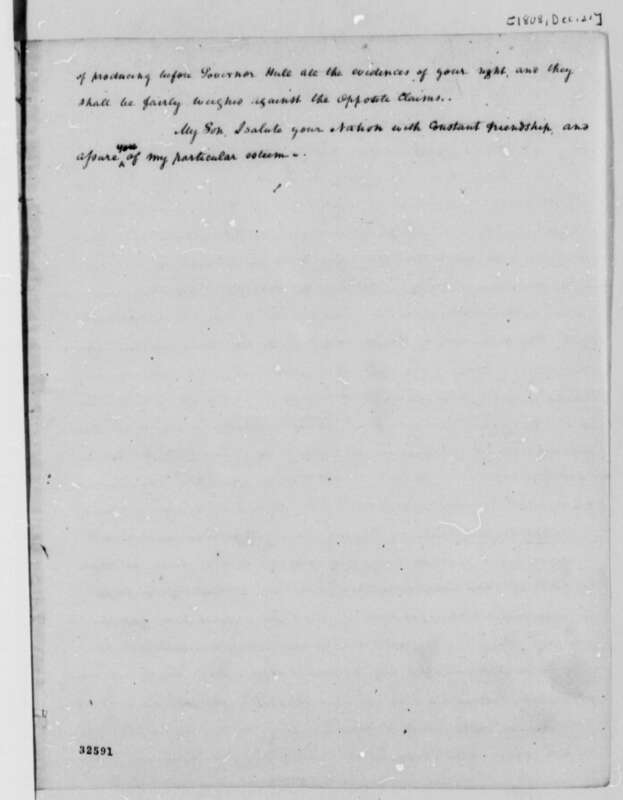 Also: "Thomas Jefferson's letter to Chief Little Turtle (page 3)". The Thomas Jefferson Papers Series 1. General Correspondence. 1651–1827. Library of Congress. December 21, 1808. Retrieved July 30, 2018. ^ a b Madison, pp. 36–37. ^ Rafert, The Miami Indians of Indiana, p. 71. ^ a b Madison, pp. 39, 43. ^ Rafert, Miami Indians of Indiana, pp. 48. 71-72. ^ a b Calvin M. Young (1914). "The Birthplace of Little Turtle". Ohio Archaeological and Historical Quarterly. Columbus, Ohio: Ohio Archaeological and Historical Society. 23: 136–37. Retrieved July 30, 2018. ^ Rafert, Miami Indians of Indiana, p. 74. ^ Charles Theodore Greve (1904). Centennial History of Cincinnati and Representative Citizens, Volume 1. Biographical Publishing Company. p. 40. Retrieved 2013-05-22. ^ a b Arville Funk. Sketchbook of Indiana History. pp. 15–16. ^ Young, pp. 140–42. See also: Rafert, The Miami Indians of Indiana, p. 201. ^ Rafert, The Miami Indians of Indiana, p. 201. ^ Gugin and St. Clair, eds., pp. 234–35. ^ "The Golf Club at Little Turtle". Retrieved November 9, 2015. Carter, Harvey Lewis (1987). The Life and Times of Little Turtle: First Sagamore of the Wabash. Urbana, Illinois: University of Illinois Press. ISBN 978-0-252-01318-8. Cayton, Andrew R. L. (1996). Frontier Indiana. Bloomington, Indiana: Indiana University Press. ISBN 978-0-253-33048-2. Costa, David J. (1992). "Miami Illinois Animal Names". Algonquian and Iroquoian Linguistics. 17 (3): 19–44. Funk, Arville. Sketchbook of Indiana History. "The Golf Club at Little Turtle". Retrieved November 9, 2015. Goltz, Herbert C. W. "Michikinakoua". Dictionary of Canadian Biography Online. Retrieved 7 January 2007. Greve, Charles Theodore (1904). Centennial History of Cincinnati and Representative Citizens. 1. Biographical Publishing Company. Retrieved May 22, 2013. "Little Turtle". United States Army Military History Institute. September 15, 2011. Archived from the original on September 13, 2015. "Little Turtle (1752 – July 1812)". The Supreme Court of Ohio & The Ohio Judicial System. Retrieved November 9, 2015. Madison, James H. (2014). Hoosiers: A New History of Indiana. Bloomington and Indianapolis: Indiana University Press and the Indiana Historical Society Press. ISBN 978-0-253-01308-8. Magnin, Frédéric (2005). Mottin de la Balme, cavalier des deux mondes et de la liberté. Paris: L'Harmattan. ISBN 978-2-7475-9080-8. "Michikinikwa". Ohio History Central. Retrieved July 30, 2018. Rafert, Stewart, "Little Turtle (Mishikinakwa)" In Hoxie, Frederick E., ed. (1996). Encyclopedia of North American Indians. Boston: Houghton Mifflin. pp. 342–44. ISBN 978-0-395-66921-1. Rafert, Stewart (1996). The Miami Indians of Indiana: A Persistent People. 1654–1994. Indianapolis, Indiana: Indiana Historical Society. ISBN 978-0-87195-111-3. "St. Clair's Defeat". Ohio History Central. Retrieved July 30, 2018. Sugden, John (2000). Blue Jacket: Warrior of the Shawnees. Lincoln, Nebraska: University of Nebraska Press. ISBN 978-0-8032-4288-3. Sword, Wiley (1985). President Washington's Indian War. The Struggle for the Old Northwest, 1790–1795. Norman, Oklahoma: University of Oklahoma Press. ISBN 978-0-8061-2488-9. Young, Calvin M. (1914). "The Birthplace of Little Turtle". Ohio Archaeological and Historical Quarterly. Columbus, Ohio: Ohio Archaeological and Historical Society. 23: 105–49. Retrieved July 30, 2018. "Northwest Territory of the Great Lakes Heritage Area", Congressional Record––House, Document H12066–12076 (November 16, 1999), includes description of Little Turtle, pp. H12069–H12070. This page was last edited on 5 April 2019, at 05:58 (UTC).